OTTAWA, Oct. 15, 2018 /CNW/ - 77 developers and programmers signed up for the Canadian Real Estate Association's (CREA) first ever REALTOR.ca hackathon over the weekend at Ottawa's Bayview Yards. This is one of the many initiatives CREA is undertaking to ensure the continuous improvement of Canada's #1 real estate website, REALTOR.ca. CREA is dedicated to finding new ways to help more Canadians achieve their dreams of home ownership. "Amazing things can happen when talented and passionate people come together with a common goal" said Barb Sukkau, president of CREA. "CREA hosted developers from across Canada and beyond over a weekend of designing, building and "demoing" solutions that were focused on facilitating the homebuying and selling journey." "At TD, we have a strong history of finding innovative solutions to support homebuyers on their journey to homeownership and we're proud to be a part of the inaugural REALTOR.ca hackathon," said Roy D'Souza, Associate Vice President, Real Estate Secured Lending, TD. The winning proposal was developed by team propGram, composed of Bahar Eghtesadi, Maryam Moafi and Reza Farahani. "We had an amazing experience and we're so grateful for the opportunity to really dive into REALTOR.ca's data sets", said Bahar Eghtesadi, propGram team leader. "We're looking forward to elaborating on our idea and optimizing it." 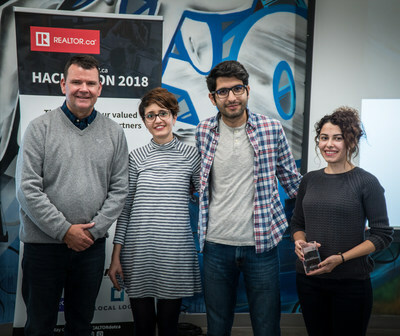 With this Hackathon, CREA demonstrated its commitment to maintaining REALTOR.ca as consumers' first choice when looking for a new home by constantly adding the features they demand and expect. Participans were able to meet CREA management and staff, sowing the seeds for potential future business opportunities. "The real estate industry in Canada is evolving rapidly and technology provides even more opportunities to improve the consumer experience," said James Mabey, Chair of CREA's Technology Committee. "We're excited to work with the hackathon teams to help foster innovation that can benefit our members and enhance the consumer journey on REALTOR.ca." REALTOR.ca is owned and operated by the Canadian Real Estate Association (CREA), one of Canada's largest single-industry trade associations. CREA works on behalf of 125,000 REALTORS® who contribute to the economic and social well-being of communities across Canada. Together they advocate for property owners, buyers and sellers. REALTOR.ca provides trusted, up-to-date and comprehensive property advertisements for residential, commercial and rental properties across Canada. Whether you have just started looking or you are ready to make that important purchase, REALTOR.ca connects you to valuable resources and local REALTORS® to help you find your dream property.